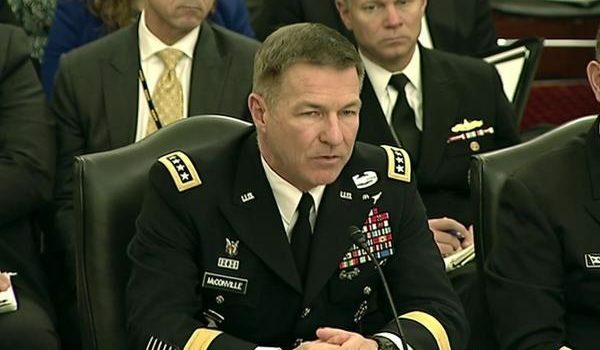 The White House has nominated Army Gen. James McConville to become the service’s next chief of staff, officials announced Tuesday during an Association of the United States Army event. McConville’s nomination was sent to the Senate Armed Services Committee late Monday, retired Army Gen. Carter Ham, the president of AUSA, told an audience attending the association’s annual Global Force Symposium in Huntsville, Ala. If confirmed by the Senate, McConville would become the 40th Army chief of staff, the service’s top general and a member of the Joint Chiefs of Staff. Army and White House officials on Tuesday did not immediately confirm the nomination. McConville, who has served as the service’s vice chief of staff since June 2017, was widely considered the top choice of defense officials to become service chief later this year. He would replace Army Gen. Mark Milley who President Donald Trump announced last year was his choice to become the chairman of the Joint Chiefs of Staff when Marine Gen. Joseph Dunford retires, which could happen by late summer. The 59-year-old from Quincy, Mass., is a 1981 graduate of the U.S. Military Academy at West Point in New York. McConville has spent much of his career flying Army helicopters, including the AH-64 Apache, OH-58 Kiowa Warrior and the AH-1 Cobra, according to the Army. Before he became the Army’s No. 2 general, he served as its deputy chief of staff for personnel as a three-star general. Earlier Army assignments sent McConville to command troops serving in the recent wars in Iraq and Afghanistan. 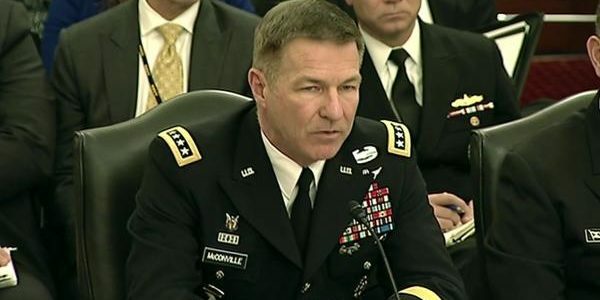 As the commander of the Army’s 101st Airborne Division, McConville deployed to Afghanistan in late 2012 to command U.S. and NATO forces in the country’s eastern region as the United States and its allies began drawing down their forces to move from a combat role into a mission primarily to advise and assist Afghan partners. Earlier in his career, he commanded 4th Brigade, 1st Cavalry Division during a tour in Iraq. Among dozens of awards and decorations, McConville has twice received the Distinguished Service Medal, holds three Legions of Merit, three Bronze Star Medals, two Air Medals, the Combat Action Badge and Expert Infantryman’s Badge, according to his Army biography. In recent years as the Army’s vice chief, McConville has helped shape the Army’s policy for preparing for the future. He was instrumental in the establishment of the service’s Futures Command, which is focused on modernizing the service’s weapons and other assets for potential future wars against a near-peer competitor such as Russia or China. McConville and his wife, Maria, have three adult children who all serve in the military.